This is Phyllis. Phyllis has trouble seeing so I have started outlining her pictures in black marker to define the lines. 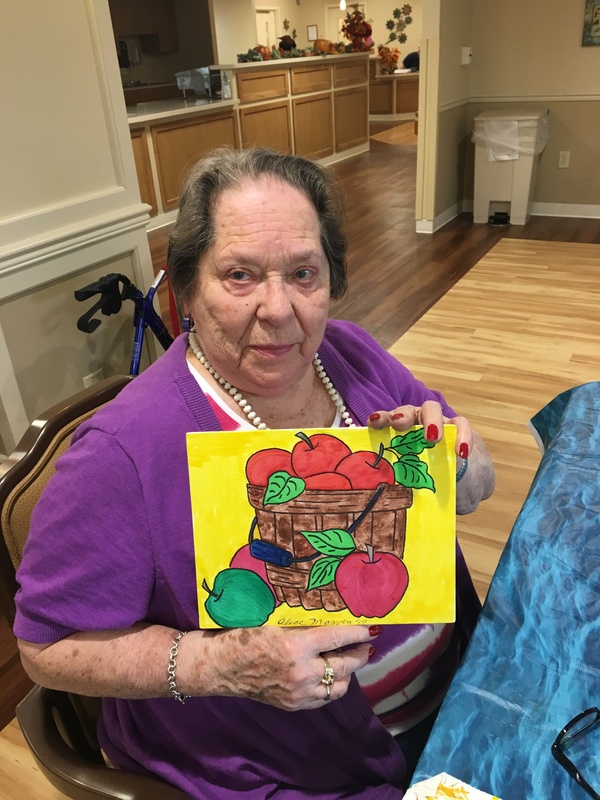 After seeing her lovely picture, the other residents asked me to outline their pictures as well. 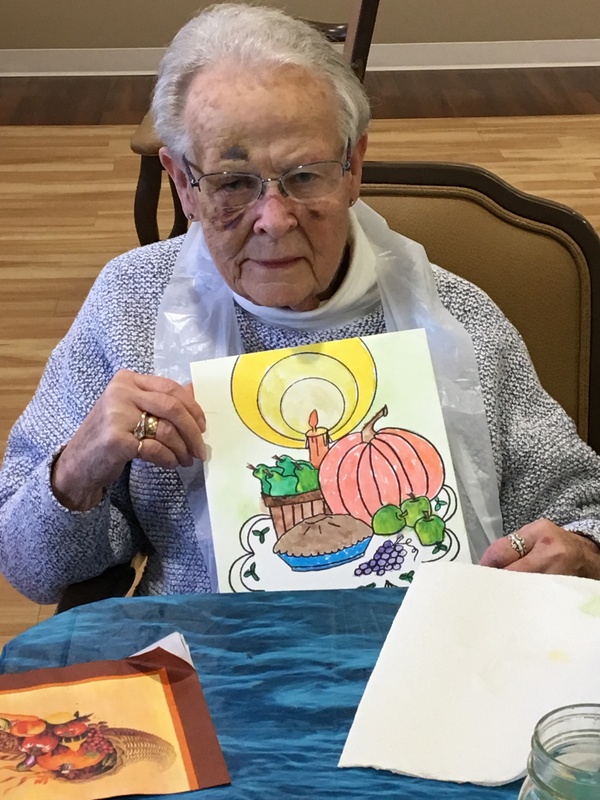 “I turned down a birthday party invitation because I didn’t want to miss art class.” That’s what Phyllis said as she took her seat at the table. “Oh, Phyllis, I’m sorry you’re missing a party! I hope it wasn’t a family member.” “No, just a good friend.” Oh my…. 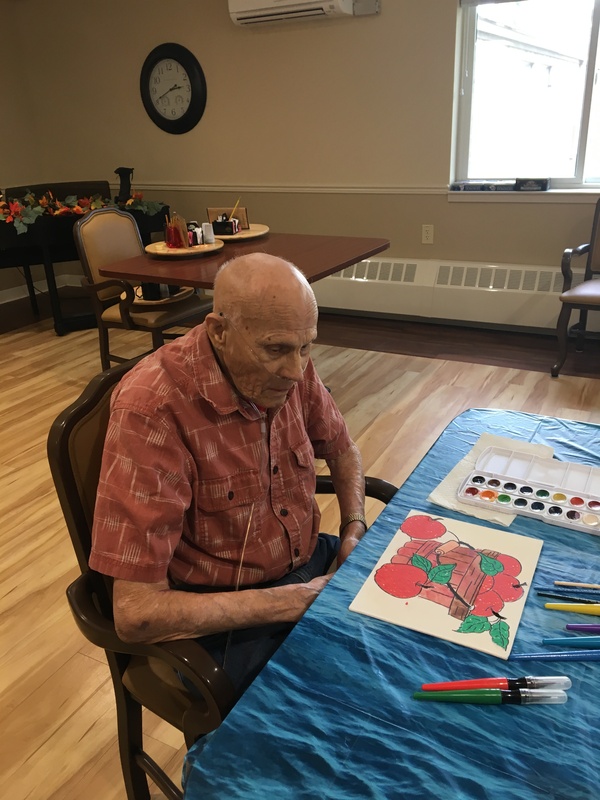 I am happy that the residents at my mom’s assisted living facility are enjoying this art class, however, I am disappointed that they are canceling other plans; they don’t have enough to fill their time as it is. But I don’t think everyone changes their schedule for me — Phyllis might be the exception. 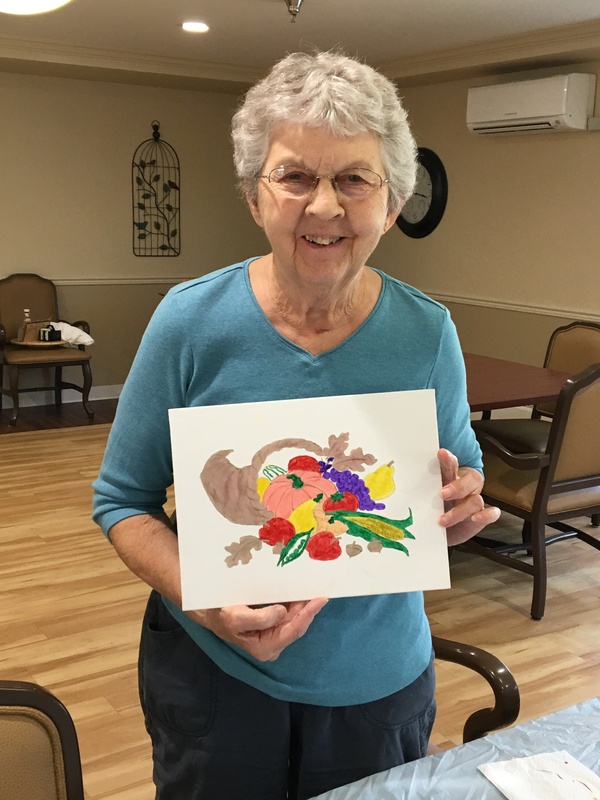 She tells me every week, “I just LOVE to do this.” And that makes me smile because the first week I came to do this art with the residents, Phyllis was the one who kept saying, “Oh, I just can’t do this. I just can’t.” But she can, and she does every single week, and she is always the first one to arrive at the table. I just love that her. Lorraine, Sharon, and Mary. This pumpkin and sunflower picture was a favorite, and they turned out lovely. A few weeks ago, Lorraine asked me to come to her room after class. Beaming, she pointed to the wall, “My daughter hung all my art work.” She was thrilled that her daughter liked her art, and thought it “wall-worthy.” My mom tells me (every week) that she knew Lorraine when she was a teenager. “When I was 14 years-old, she use to walk down the sidewalk with her boyfriend, holding hands.” I love to get nuggets of information like this. Memories from the past. These women weren’t born old. They were young and in love and had babies and had careers. I try to ask questions, hoping they will reminisce and indulge me with their stories. 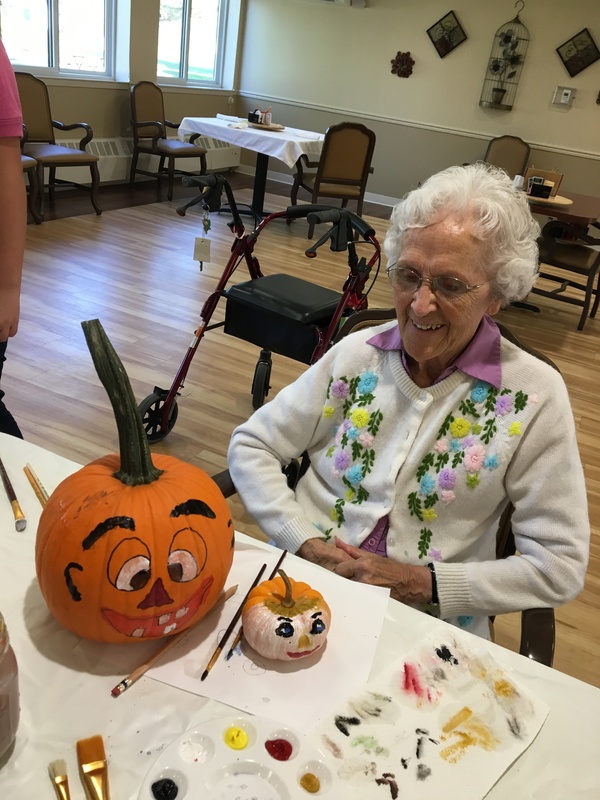 As they painted the pie in the autumn centerpiece last week, I asked, “Who loves to bake pies?” When Halloween was just around the corner, and they were painting pumpkins, I asked, “Did your children dress up and go trick-or-treating?” Sometimes I get a few answers. Sometimes I don’t. That’s okay. If they are quiet, I tell them a story about me, my children, or my grandchildren. And more than once my story has helped someone recall their story. And so it goes. This is Hazel. 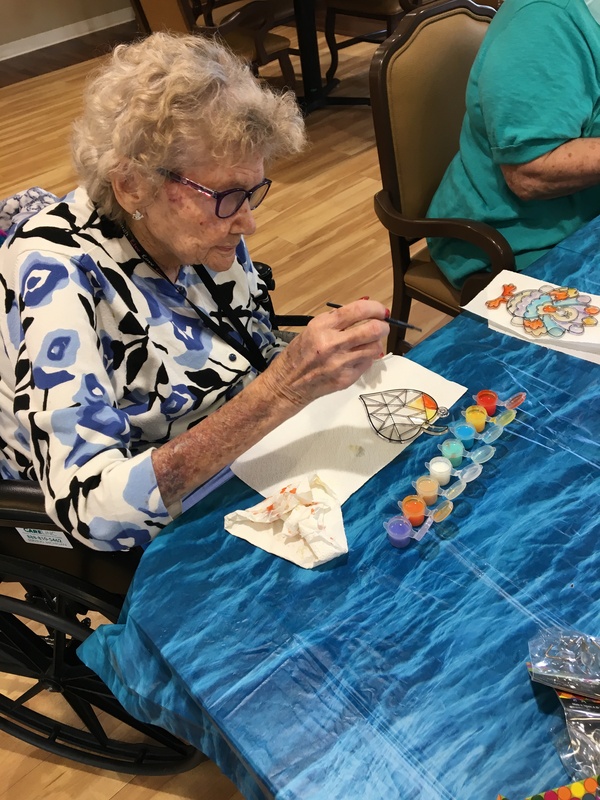 She was also new to class and LOVED the sun catchers. 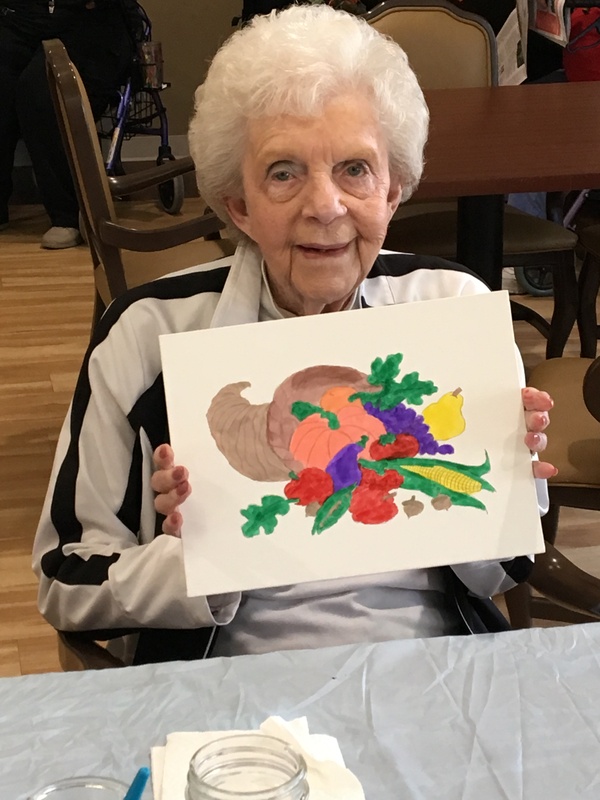 She came back to paint our fall centerpiece picture. What a sweet sweet lady. I have prepared 5 pictures for them to paint over the last several weeks. 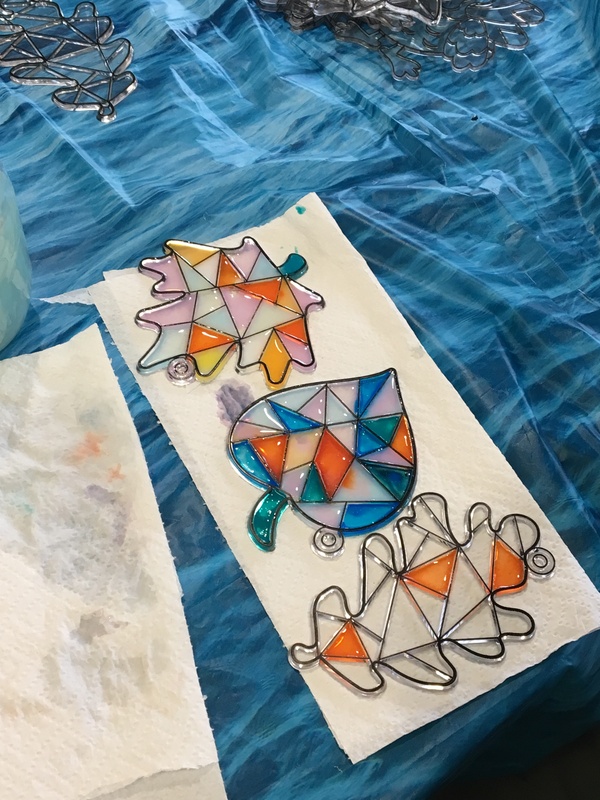 Two weeks ago, I thought we’d do something different, so I brought sun catchers for them to paint. I found some nice fall leaf patterns that would look pretty in the windows in their rooms. 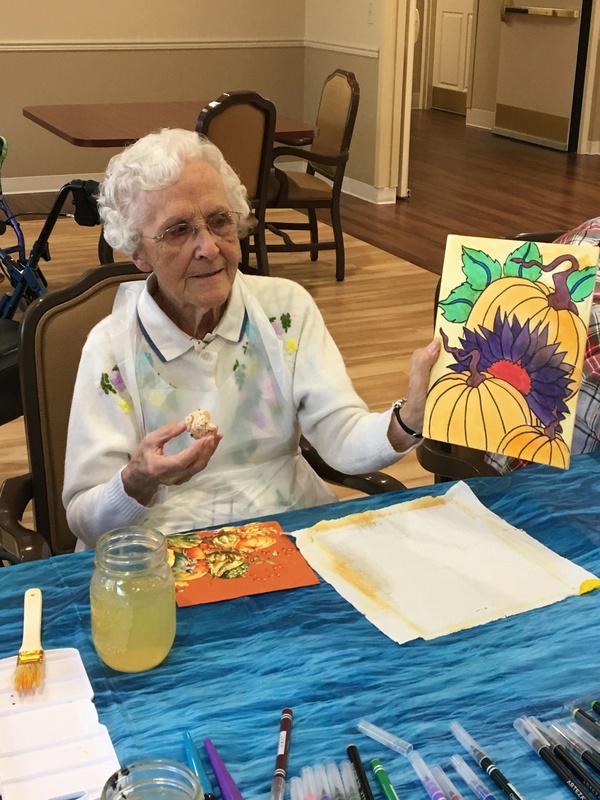 One lady was new to class (she had walked by the previous week and noticed the beautiful pumpkin and sunflower picture we were working on.) When she sat down, I could tell she was a bit disappointed in the sun catchers. After we had painted for about 15 minutes, the chatter at the table had mixed “reviews” of this more tedious art work. But most liked the change. This new artist boldly said, “I think it’s boring.” That made me laugh out loud. You know, when you get to be 90 years-old, there is no need to pretend or beat around the bush. And that’s okay. She didn’t come back last week. 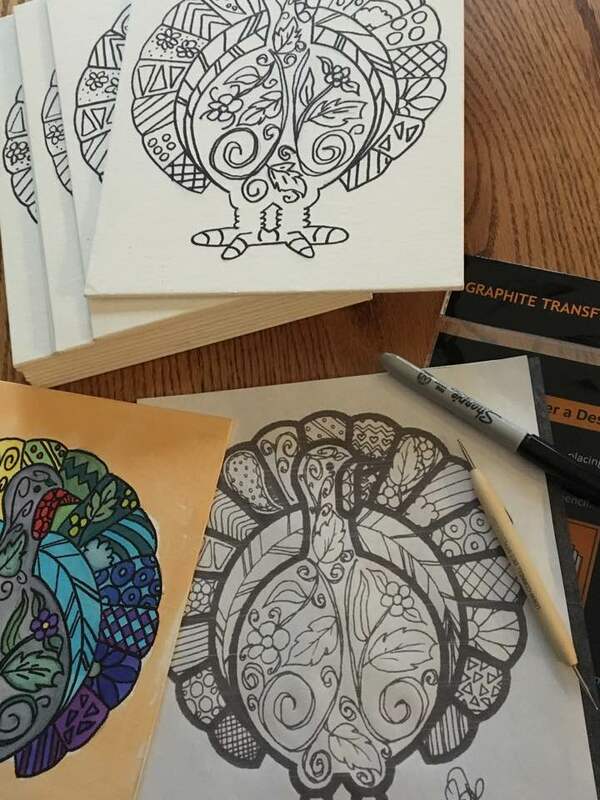 But I’m going to seek her out on Friday because we’re painting an awesome turkey for Thanksgiving. I think she just might like it. Sneak preview of our Thanksgiving turkey picture. 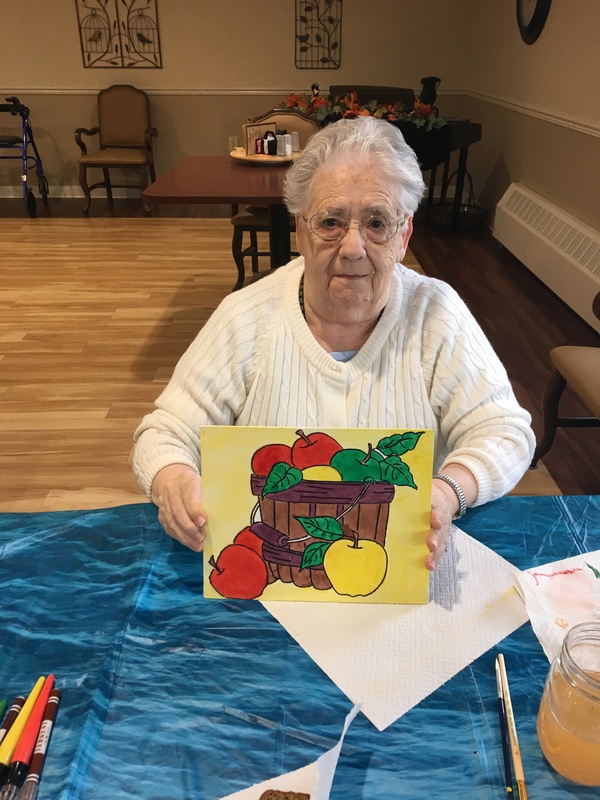 Here are a few pictures of our fall paintings. I am so thankful I can be a part of this. 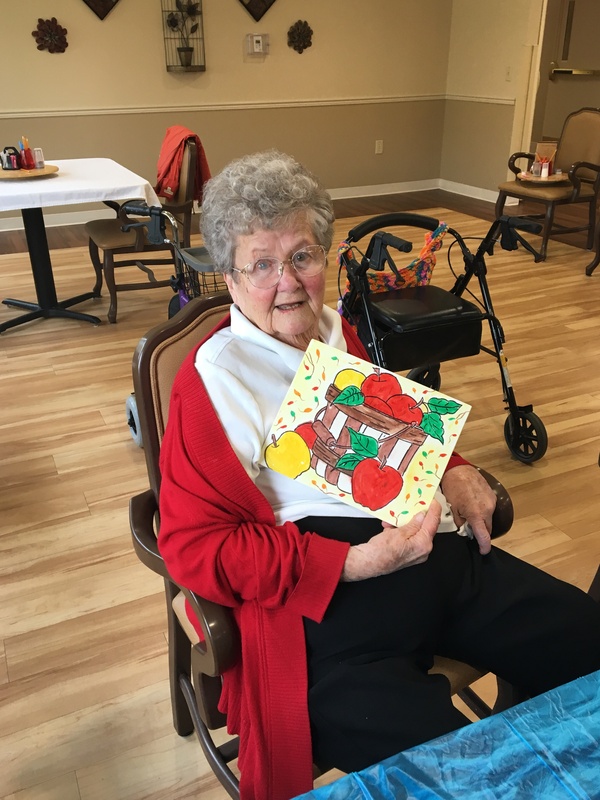 The residents are very proud of their pictures. I am too. But more beautiful than the art work are the artists. I think Roberta has some past experience in art. 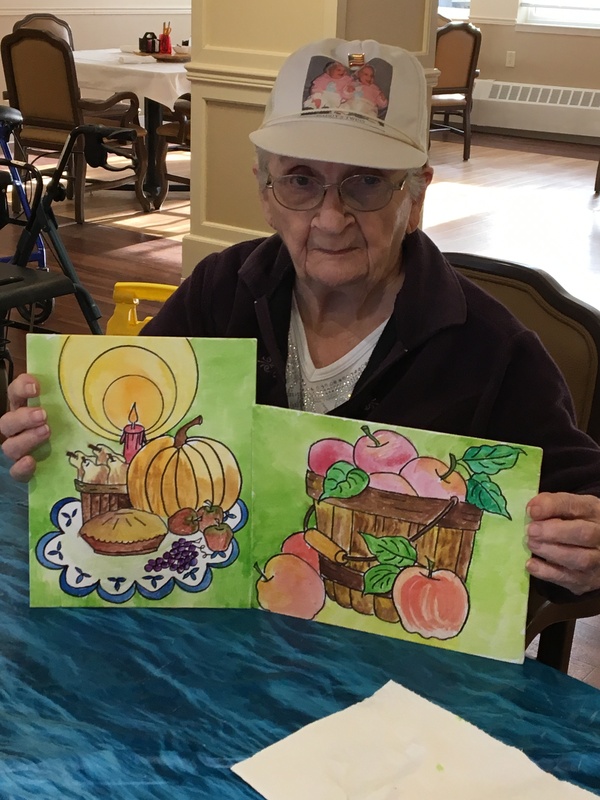 She missed a few weeks so she opted to paint two pictures last week. She wears this hat every day because the fluorescent lights hurt her eyes. This is sweet Mary. She is pretty quiet, but she giggles at my jokes. 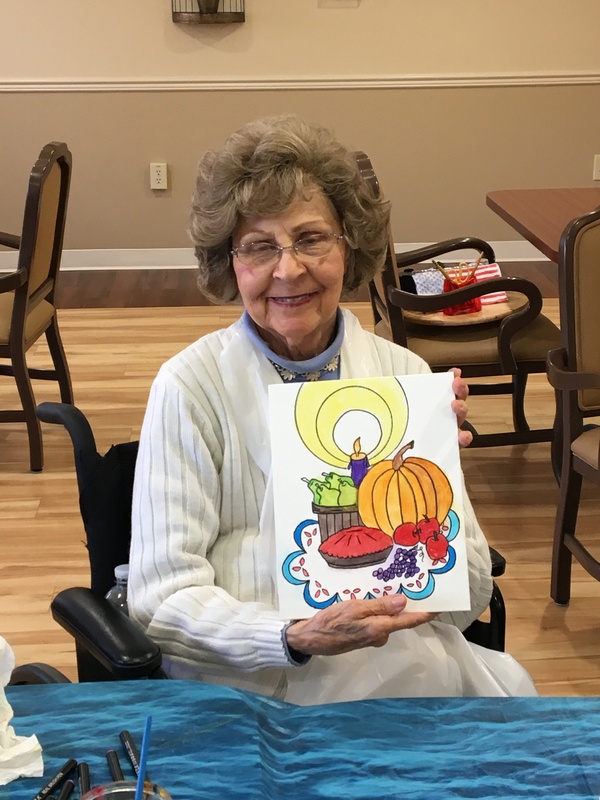 She has just finished her picture and is enjoying a cookie before she goes back to her room. This is Sherry, but many CNAs still call her Mrs. Davis. 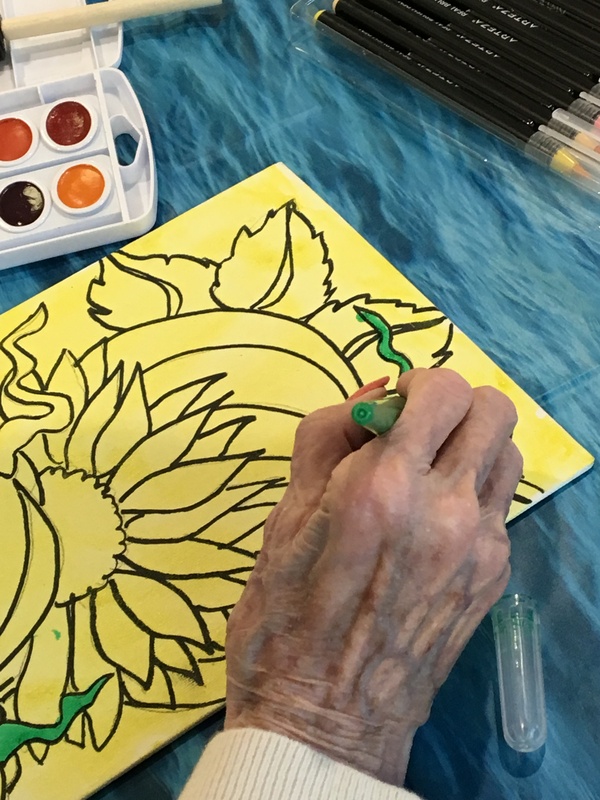 She earned their respect many years ago… Sherry was disappointed last week because she feel asleep after lunch, and no one woke her up for art class. I wont let that happen again. This is Oran. He is very quiet. But he paints whatever I set in front of him. He eats my cookies and stays in class until everyone is done with their picture. There was a time when someone like Oran intimidated me. But not anymore. I really really like this guy. This is Alice — my mom. I started these classes for her. But I know now, God intended them for me. Mom has her own art supplies in her room and paints two or three additional pictures between classes. This is Sharon. Sharon comes every week. She always has this beautiful smile on her face. This is Thelma. She has been to every single class. Often during class, she sets her paint brush down and just rests for 10 minutes. Then she picks up her brush and begins again. And even though it may be 80 degrees in our room, she will always wear a sweater. This is Irene. She is relatively new to class — I think she has been to the last three. I walked her back to her room when we did the sun catchers. She pointed to her picture on the window sill, and told me how proud her children were of her painting. I love that. This is Lorraine. She is sharp and witty and very fun. When I grow up, I want to dress like Lorraine — always beautiful inside and out. Just a silly painted pumpkin, but look at Mary’s face. I am so blessed when I look at this picture. Their hands. No words needed…. If you missed how all this got started, you can read about it here.